This week’s menu looks a lot like last week with the exception of Easter lunch. My explanation of why will probably make you feel a whole lot better about meal planning and getting dinner on the table. It’s an eat what you’ve got week around here. The freezer and pantry are starting to fill up so I made this week’s menu around what we already have. But, I did manage to still make it work with my portion fix containers. I am hosting Bunco at my house this week with a healthy menu that is still filled with tasty treats. There are so many delicious recipes in the FIXATE & FIXATE2 Cookbooks that I’ve decided to plan a FIXATE Bunco Menu around the recipes from the FIXATE cookbooks. I have officially completed my Ultimate Portion Fix Master Coach Certification! I really enjoyed digging deeper into the details of the color coded meal plan that has helped so many people develop healthy eating habits. This week we are following the Portion Fix Carb Cycling Modified Plan. It’s a great way to get started with carb cycling if you’ve never done it before. 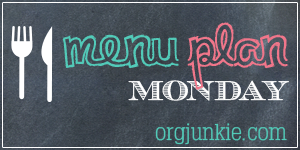 This week we’re giving the Portion Fix Vegan Meal Plan a try. Now I’m not a Vegan or Vegan expert so please excuse any faux pas in my meal plan. As part of the Ultimate Portion Fix Certification Autumn suggested we try each meal plan and that’s all I’m doing. I based this week’s menu on the Portion Fix Vegan Food List and recipes labeled Vegan in the Fixate 2 Cookbook.